nice pic. amazing how the WWII monument looks so small and unimportant next to the Washington Monument. Impressive in real life though! The wading pool is already starting to look scummy! YEAH, DC summers! On the cusp of spring we were at the Botanical Garden but first passed the ellipse in order to get there. The wind was blowing hard and in the roughened waters of the ellipse, bobbing up and down, were what seemed to be fifteen or so brand-new, white jogging shoes. Blinking the wind from our eyes, we saw the shoes were in fact sun-brightened gulls, city gulls and a laughable sight. 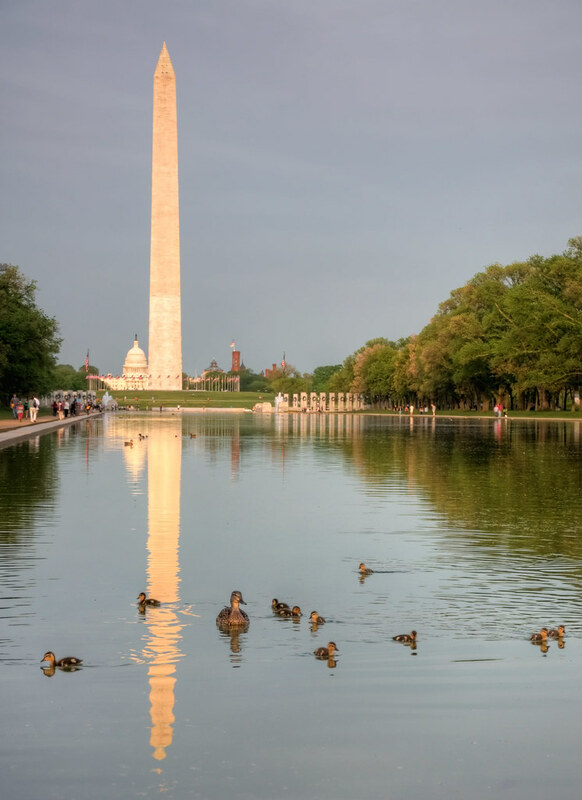 For whimsy’s sake, would love you to crop mid-way down the photo to show an overturned obelisk with the mother duck and brood; or crop further so that only the one duckling is seen shattering the overturned monument. I actually have that exact photo, so no cropping will be necessary! I posted this picture instead because I thought the the scattered reflection of the Washington Monument would be too hard to identify, but since I’ve had multiple requests for that composition I’ll post it sometime in the future. Thanks for all the comments!